Living with untreated hearing loss is a challenge, and you’ve had your fair share of misunderstandings and problems communicating. You struggle to order a coffee at your favorite cafe and have given up talking on the phone. But untreated hearing loss is about much more than problems communicating. Did you know that hearing loss increases your risk of accidents? You might not think that accidents are very common. They’re accidents after all, right? However, the Centers of Disease Control and Prevention (CDC) stated that in 2013, accidental injuries led to 28 million emergency room visits! Accidents are a major concern, and lead to many deaths each year. One of the most common causes of accidents are sensory impairments. Those who have difficulty seeing, hearing, or smelling are at a far higher risk of accidents than those who’s senses are sharp. According to a study by the Brigham and Women’s Hospital in Boston, adults with hearing loss are much more likely to suffer accidents or injuries. The study took its data from survey reports from the National Health Interview Survey, a country-wide survey in which 232.2 million American’s answered questions about their health and wellbeing between 2007 and 2015. The survey included questions about people’s hearing health, and reports on any injuries in the last 3 months. Out of all the participants, 15.7% reported less than “excellent” hearing, and after analyzing this mountain of data, researchers found that those with “a lot of trouble hearing” were 50% more likely to be injured! 6.6 million adults reported experiencing accidental injuries, and of those many rated their hearing as less than “good”. The study, published in JAMA Otolaryngology, found that the worse the hearing loss, the more prone adults were to accidents. While you might not think that hearing loss and accidents are closely linked, not being able to hear plays a huge role in your safety. “Hearing is a special sense that plays an important role in warning us of danger in our surroundings,” says Neil Bhattacharyya at Brigham and Women’s Hospital. How many times this week have you missed the stove alarm, or accidentally burnt something in the kitchen since you couldn’t hear the timer? Do you miss the phone ringing, or fail to hear the doorbell? If you have trouble hearing these sounds, you might not hear the smoke detector in the kitchen, or the fire alarm in the building. Hearing loss is a hazard outside the house too. If you don’t hear the car honk when you step out to cross the street, or don’t hear the shout from the child whose ball is about to roll out in front of your vehicle, you’re putting yourself and others at risk. If you don’t hear the emergency sirens about to come around the corner or fail to notice the ding from the railroad crossing, your chances of having an accident or injury is high. 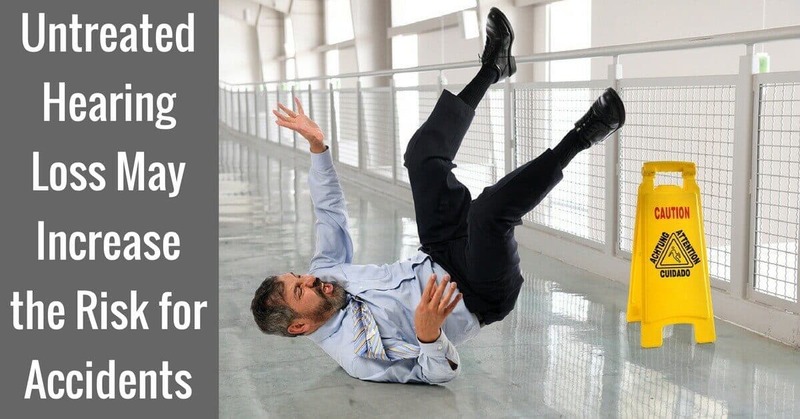 Finally, hearing loss has also been linked to a greater chance of falls. This is because our ears play a big role in balance. When you’re living with untreated hearing loss, you’re more likely to feel unbalanced, thus increasing your risk of falling or being injured. Hearing tests are quick and easy, and hearing aid fittings are a breeze, so getting your hearing checked is one of the simplest ways of protecting you and your loved ones and preventing accidents. Don’t fall into the trap of thinking that your hearing loss is not a big deal. “Many adults believe that hearing loss, particularly due to aging, is ‘normal’ and therefore of little consequence other than, perhaps, social difficulties,” says Bhattacharyya. However, if you can’t hear the warning signs, or don’t realize something is wrong, you’re facing far more than communication problems. You’re opening yourself up to an increased risk of accidents. The first step to being safe is being aware of the dangers in our environment. If you’re ready to hear what’s going on around you, visit us at My Hearing Centers for a hearing test and consultation. We have the hearing aid that will help you hear, reduce your risk of accidents, and keep you safe.